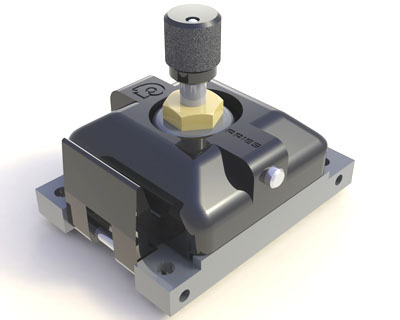 "Aries, a world leader in test socket technology"
The ADJUSTABLE Chip Scale Test Socket:........ Freedom of Range for different device thickness options, or device fragility. For prototypes of a chip under development that will always have the same footprint, but may have the thickness of the package vary until the design is firmed up, or have a requirement to apply minimum force, and no more, such as with fragile ceramic chips or very thin devices. 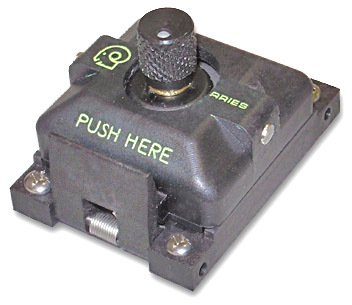 Aries has developed a way of making the depth of the pressure pad adjustable, using a micrometer adjustment. This ability to incrementally add force to achieve a good connection without fear of cracking or bending a fragile device, such as a ceramic chip or a thin device, or when dealing with variable thickness issues, is a great way to only apply the minimum force to get the connection and no more. 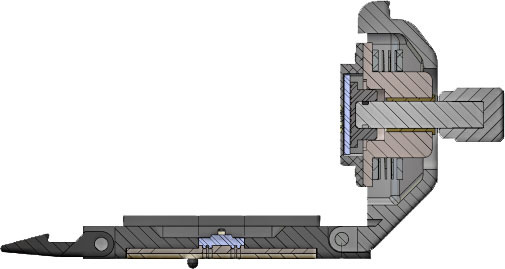 The cutaway elevations on this page shows just one specialized application. Aries can accomodate many others. 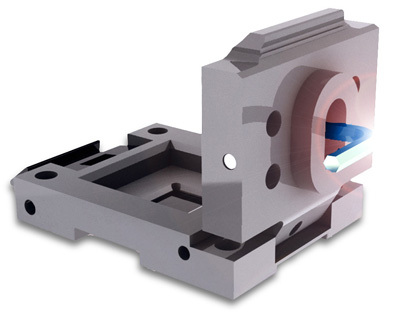 For example, other variations can include an optical pathway down the center of the adjuster. We have the capability. Let us build exactly what you need. 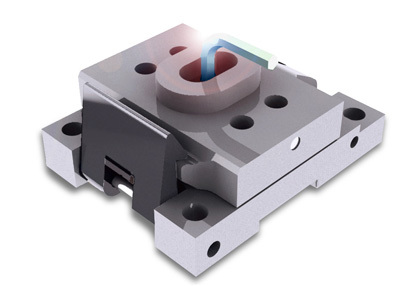 ADJUSTABLE, variable thickness, Chip Scale Test Socket for devices in developement. NOW available 0.3mm pitch and up. Chip Scale Test Socket Test & Burn-In of CSP, MicroBGA, QFN, DSP, LGA, SRAM, DRAM, PQFP, Flash Devices, etc. Any SMT Device! For prototypes of a chip under development that will always have the same footprint, but the thickness of the package will vary until the design is firmed up. 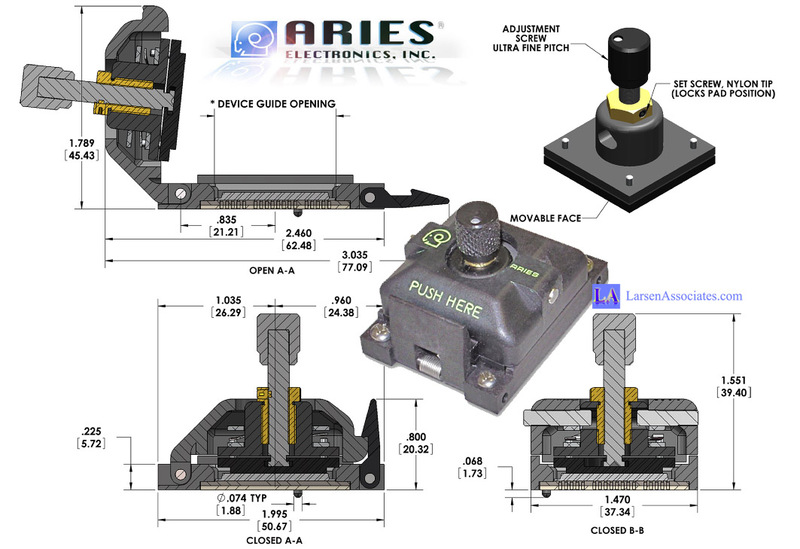 Aries has developed a way of making the depth of the pressure pad adjustable, using a micrometer. 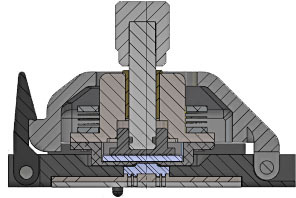 Other variations include and optical pathway down the center of the adjuster. For Test & Burn-In of CSP, MicroBGA, DSP, LGA, SRAM, DRAM, QFN, PQFP, BGA, Flash Devices, etc..Any Surfance mount device. 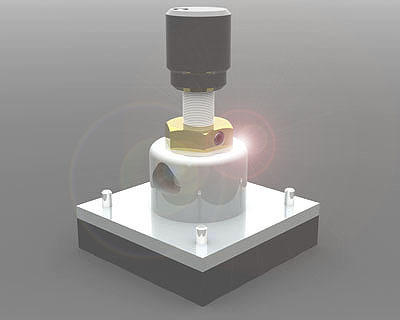  Any pitch device on 0.30mm or larger.  Pressure mounting, no soldering required.  4 Point crown insures scrub” on solder oxides.  Signal path during test only .077” (1.92mm)  Accommodates any package up to 27mm2.  Small overall socket size/profile allows maximum number of sockets per BIB and BIB’s per oven, while being operator friendly.